San Diego, CA (December 7th, 2017) IDW Games announces the social deduction board game, Edgar Allan Poe’s Masque of the Red Death. Coming to Kickstarter on January 10th 2018, Masque of the Red Death features distinctive art and is fully illustrated by Gris Grimly. Game design by Adam Wyse, this game of deduction places you as nobles at a party looking to gain popularity before the Red Death arrives. With art from Gris Grimly, this marks his first tabletop game, allowing his art to cover the cards, boards and game pieces all incorporating his unique style which captures the tone of this sinister story. 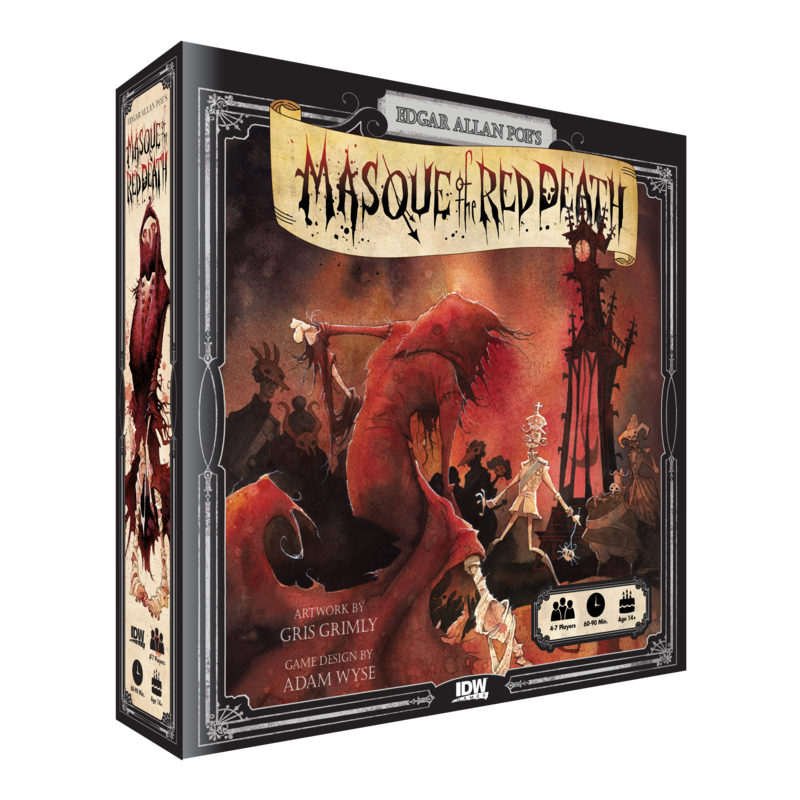 Based on Edgar Allan Poe’s story and Canadian Game Design Award Finalist, Masque of the Red Death pits you and 4 to 7 players against each other as you hobnob with the Prince. But disaster strikes at midnight! Players have to balance their actions carefully between currying the Prince’s favor and discovering what rooms the Red Death will visit. After all, the highest social standing only matters if you survive. Planned as a Kickstarter, this social deduction game of popularity and danger, Masque of the Red Death will be launching on January 10th 2018 and will be available in stores soon after fulfillment.